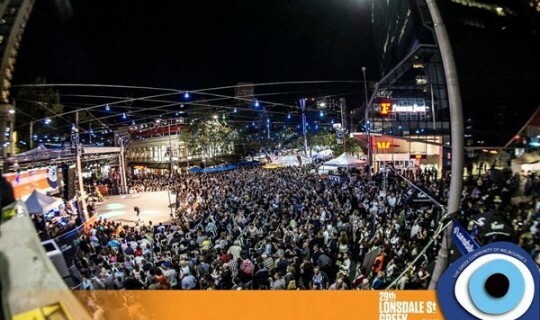 More than 100,000 people flooded Lonsdale Street over the weekend, heading out to enjoy the largest event in the Greek Community’s history. With 65 stalls lining the entire historic Greek precinct, the food on offer was the most diverse and delicious it has ever been, with people queuing to sample all weekend. In keeping with what undoubtedly became a festival of food, the Procal Greek Kitchen was the place to watch a number of cooks and chefs demonstrate favourite recipes while 2014 MKR (My Kitchen Rules) favourites Helena and Vikki Moursellas kept audiences entertained throughout each demonstration. Presenters included Kathy Tsaples (Sweet Greek), Philip Vakos (Bahari), Angela Nicolettou (Angela’s Kitchen), Spiri Tsintziras (Writing Spirit), Angie Giannakodakis (Elyros) and Mary Valle (Mary’s Kitchen). During the evening, the Greek Kitchen was transformed into a ‘taverna’, with many styles of Greek music being played and plenty of dancing on the street. The Festival’s bar and home of the Akropolis Ouzeri was the ideal place to chill and take in the festivities from a comfortable location, while younger Festival goers had fun making Spartan masks and olive wreaths. Massive crowds gathered around the Delphi Bank Stage on Saturday evening to hear the hugely talented Alkinoos Ioannidis belt out his soulful lyrics for over two hours. Prior to him heading out on stage, Prime Minister Malcolm Turnball and many other politicians including leader of the Federal Opposition Bill Shorten, Premier Daniel Andrews and Leader of the Opposition in Victoria Matthew Guy took part in the official opening. The Qatar Airways Stage was the place to be late on Saturday evening as people danced to the latest Greek tunes from Rythmos DJs. SBS Greek Radio and 3XY Radio were also present at the Festival, staging outside broadcasts across the weekend. This year’s program featured 17 dance groups and 18 bands playing Greek reggae, jazz, traditional, rebetika and contemporary styles, which saw more than 300 performers hitting the Festival’s three stages. Greek dancing groups gave some of the most polished performances to be seen on the Festival’s stage, demonstrating just how energised Greek culture is in Melbourne. For those with a competitive streak accepted various challenges in the Zorba ‘til You Drop dancing competition presented by Qatar Airways, the Loukoumadomania eating competition hosted by Honey Dee Loukoumades and the Festival’s inaugural Magic Mic singing competition. Winners in the respective competitions were; Toula Katsouranis (dancing for 48mins earned her a flight to Greece), Cal from Hulksmashfood demolished a mountain of loukoumades in 91seconds and Dion Papaspyropoulos impressed the judges with his rendition of Thelo na me Niosis by Nikos Vertis. The Greek Community would like to thank every single sponsor, performer, musician, dancer, food presenter, competition entrant, MC, stall holder and volunteer for giving life to the Greek Community's largest. The 29th Lonsdale St Greek Festival is a Greek Community of Melbourne event.